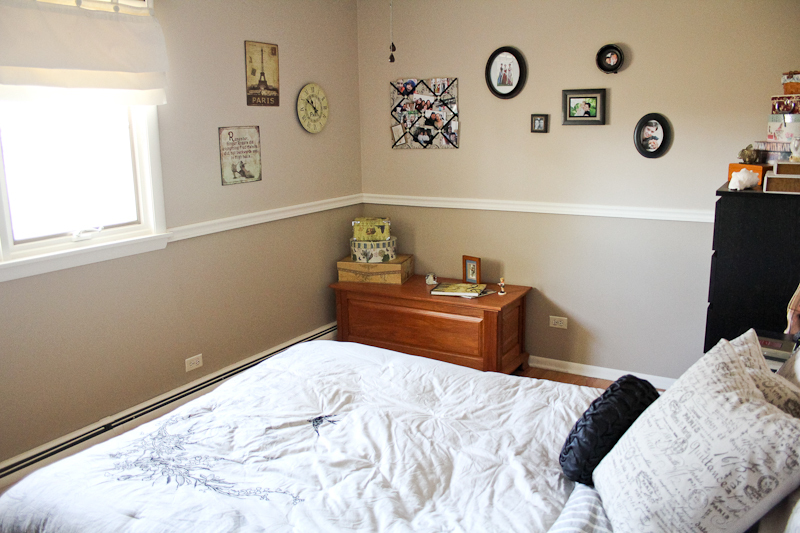 A Lass Of Yesteryear: Pictures of the finished room!! 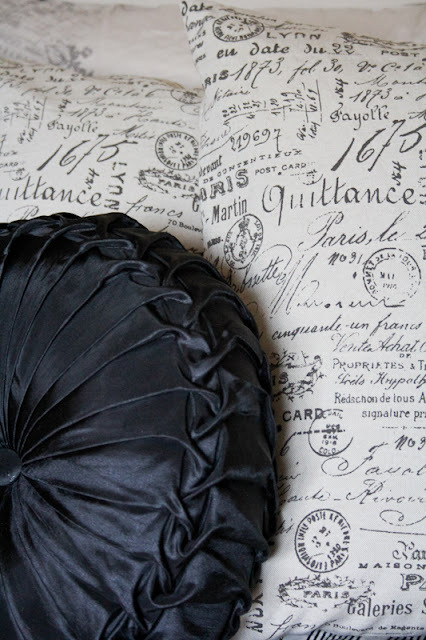 I went with a vintage, french, postcard, eiffel tower theme. Hobby Lobby and World Market are dangerous stores, people! I LOVE my full sized mirror! Never had one before - have no idea what I did without it! :) It also turns and on the back side is a book shelf. Score! The pillows were the first things I got for my room, which made me decide to do this theme. I was debating between this and a very bold/modern look. Then I saw these pillows and said "I need them" and the decision was made. 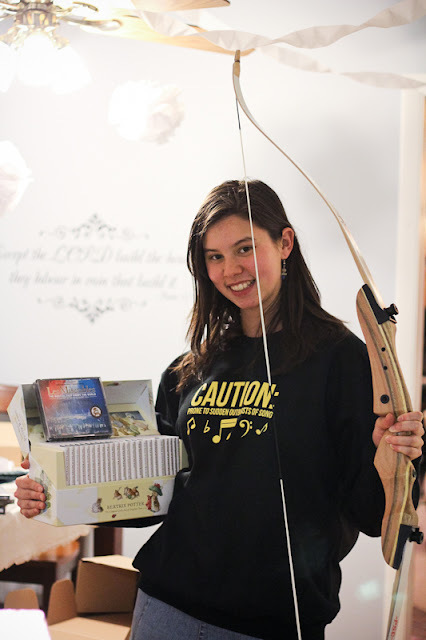 Les Miserables 10th Anniversary Concert on CD, Beatrix Potter collection, Bow, and a sweatshirt that says, "Caution: Prone to Sudden Outbursts of Song". Um, yes, that's me. It looks fabulous! 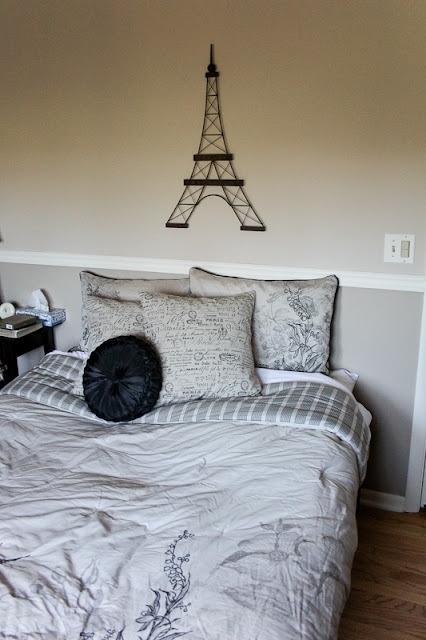 Love the Eiffel Tower on the wall! Nice bow! I like it! We have got to get together and chat sometime. Love the room (and the pillows!! ), can't wait to see it in person! :-) And yes, full length mirrors are so convenient, so often! Oh dear, is that the complete works of Beatrix Potter, bound in individual books....?? Please don't let Mom see those; she will be so envious! Where did you find the mirror/bookshelf?!!!!! You did such a great job, T! It looks 200% better than it did before! Yeah! Glad to see pictures of your latest project. 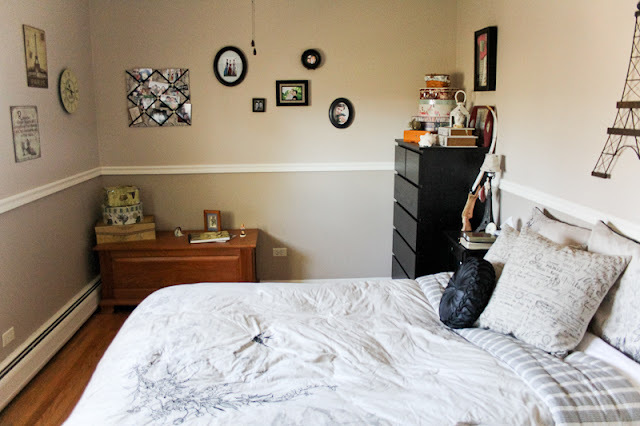 It must be so exciting to have your room (mostly;) done. Kaila - Thanks! I agree - we really do need to chat and get to know each other better! Hopefully an opportunity will come soon!! Emma - Fellow music fan - yeah, the hooks are one of my favorite parts too! :) Thanks for commenting! Lily - Yep, the whole set of Beatrix Potter... I was pretty excited! They're so cute!! Tell your mom she can come read my set anytime! 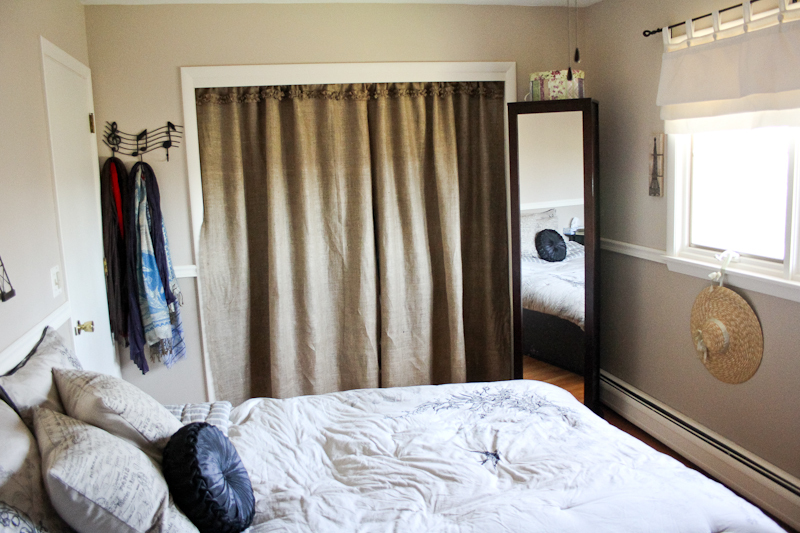 :) We need to get together soon so you can see the room - you are in at least two pictures on my wall, fyi! ;) Miss you! Laurelyn - I would LOVE to come shoot with you!! I need a rest for the arrows first, but I'll let you know when I get that and we can set up a time to shoot together! Such fun!! Moriah - It is really exciting, and I'm really pleased with how it came out! You'll have to come see it in person sometime soon! Miss you! Creative b-day gifts, Tara! You have a thoughtful family. and I LOVE your room and how everything turned out. hard work pays off! wish I could have been your partner in crime sanding the floors and shopping for the decorations and all the other fun stuff! Christie - I wish you were my partner in crime too - would have been twice as fun with you there!! I miss you! !